Sean McLoughlin of Cork City reacts after Alexander Søderlund of Rosenborg scored his side's second goal during the UEFA Europa League 3rd Qualifying Round Second Leg match between Rosenborg and Cork City at Lerkendal Stadion in Trondheim, Norway. Former Republic of Ireland manager Brian Kerr has slammed the 'mickey mouse' development of Irish domestic football after a dismal European campaign for League of Ireland clubs. 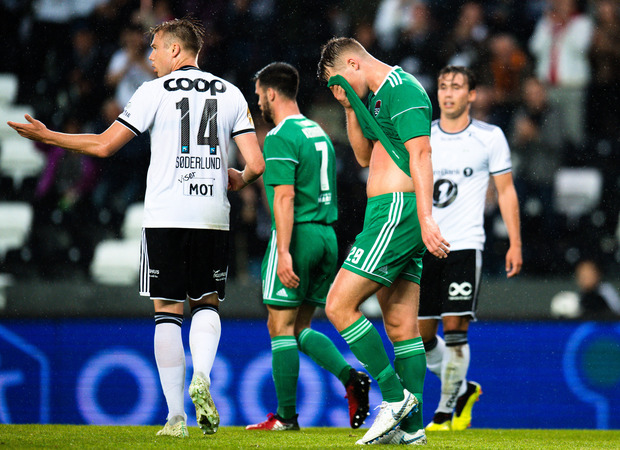 Irish interest in Europe was ended as Cork City dropped out of the Europa League with a 3-0 defeat away to Rosenborg last night, compounding the 2-0 home defeat the Norwegian champions inflicted on the Irish side last week. Last year's Airtricity League champions also fell to a 4-0 aggregate defeat to Legia Warsaw in their Champions League qualifying tie in July, while Dundalk, Derry City and Shamrock Rovers also failed to progress in European competitions this season. Speaking on RTÉ last night following Cork City's defeat, Brian Kerr criticised the lack of promotion of the League of Ireland, and also the poor standard of facilities at the disposal of Irish clubs. "We have a league of which there is no real promotion of, or marketing of," Kerr said. "John Caulfield has said there isn't marketing for the league; there isn't enough professionalism about the promotion of the league. The image for the league isn't good enough for us to retain players. "The whole image around that promotion and the development of the stadiums, it's kind of a mickey-mouse, piece-by-piece development. There's talk of this stadium getting developed, putting an all-weather pitch here and maybe we'll do a grass one there, maybe we'll build one stand at a time. It's all piecemeal. "A lot of the grounds are not up to standard, dressing rooms are not up to standard. There's a huge amount to be done for the league to have credibility, but we need to have good results in Europe to have that credibility." Kerr highlighted Cork's defeat away to Norwegian champions Rosenborg, and said the structures are simply not in place for Irish clubs to succeed in Europe. "The tradition at the club [Rosenborg] and the success they have had over years means that they have a knowledge base and a culture, and they know what it takes to win matches and European games against most reasonable opposition. "Now, can we get to that stage in our league? Not as it's currently structured. We've done too much fiddling around with the structure of our league, about whether it is a ten-team or twelve-team league, how many matches we play, whether it's three rounds or four rounds. "We're not dealing with the real core issues: the promotion of the league, the marketing of the league, the professionalism of the league, the back up structures of the league. "Even if you take the first round of the FAI Cup last week, it was almost a state secret apart from RTE's efforts and the Daily Mail, the newspaper that sponsors the competition."